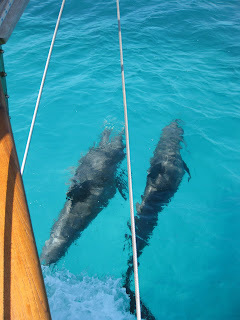 Dolphins joining us on the last leg of our journey from Key Biscayne to Marathon. We made it safe and sound to Marathon. I am not sure whether to report that the trip was better or worse than the trip from Fort Lauderdale to Miami, but it was an experience that we needed to put under our belt to better prepare us for future trips. We started the three day trip out Biscayne Channel, through the stilt houses. These houses are now managed by the state park, but at one time started as a single bait shop in the 30’s to grow into about 7 bustling fish camps over the flats. The sun was shining and the waves nonexistent. This was going to be a good trip. 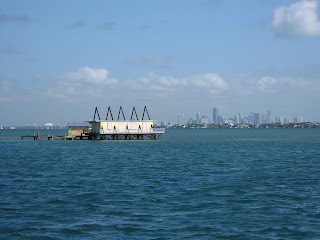 Stiltville houses lining Biscayne Channel. 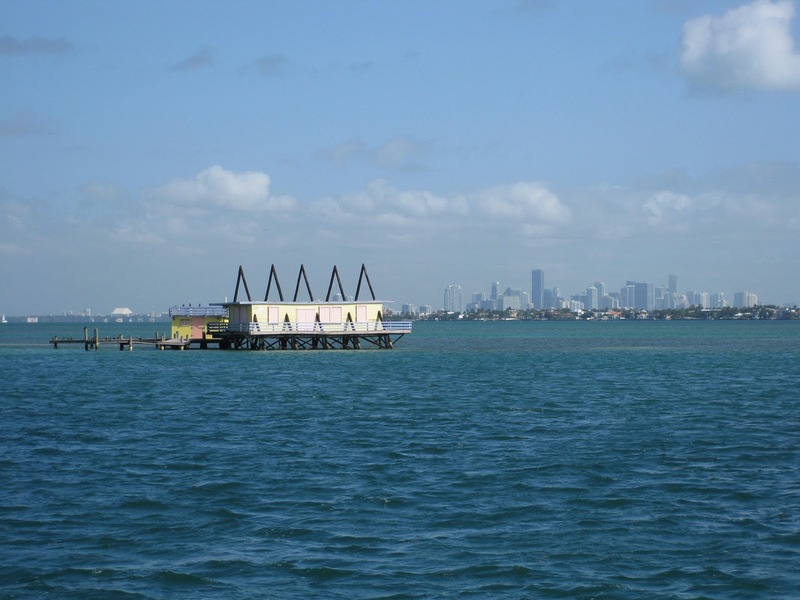 Looking north west from Stiltville, the Miami skyline can be seen in the distance. We finally got out into Hawk Channel after two hours, to watch as the waves built. However, unlike the first outside run, the winds and waves were coming from behind. Both were coming in slightly off from her stern, making the passage manageable. We knew that we had one or two possible anchorages ahead, one around 3 pm and the other around 8 pm; one on the north side of Penekamp Park and the other on the south side of Penekamp Park; neither was optimal. The one on the north side of the park would require navigating up through a privately maintained channel requiring local knowledge, but provided both depth and protection. The one on the south side of the park was exposed and a bit far for a days’ run, but was just off of Hawk Channel and easy to navigate. This would be a test no matter what anchorage we chose. We ran the whole day just by wind speed, averaging 5 knots with just the jib, and slightly reefed at that. 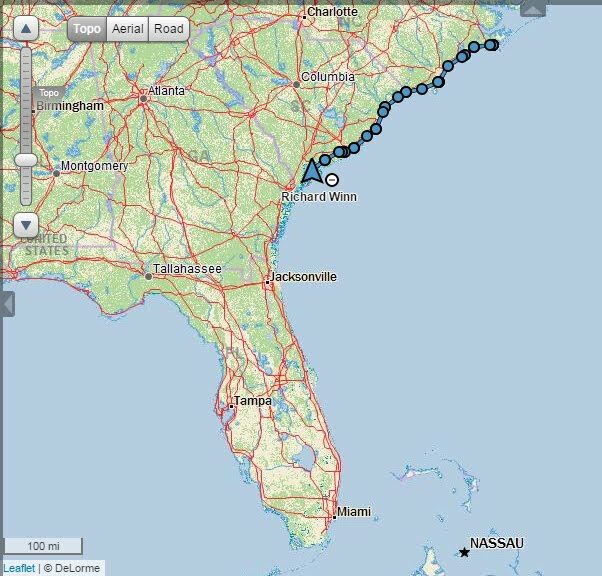 We made it to our first potential anchorage at around 3 pm, and attempted to enter the channel to Caesar Creek. The channel was well marked with red and green markers throughout the entrance, but the channel was about as wide as a toothpick. 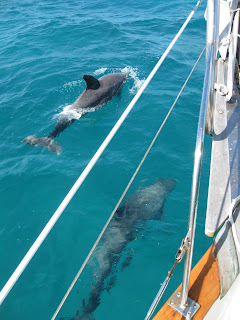 The winds by this time had increased, pushing us into the shoaling side of the channel. Even though reports on Active Captain mentioned that boats with our draft would not have any problem getting into Caesar Creek even at low tide, the winds were not going to allow us. Once we measured 6 foot depths and Layla was bumping bottom, we backed out and we ‘high-tailed it out of dodge’. We decided that it was better to find a place to anchor here rather than continue on to the unknown. There were two ‘potential’ anchorages, one on each side of the channel, with depths around 10 feet. We decided on the northern of the two, let down the anchor, and crossed our fingers that it would hold. It did, and continued to do so for the next 18 hours. 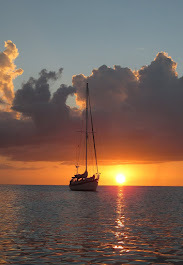 Sunset at anchor overlooking the south end of Elliott Key. The waves may not look all that big, but with their period, it made for a rocky ride. We spent the first two hours pissed at ourselves for getting ourselves into this situation, and the next two hours pissed at NOAA for not predicting these incredible winds. We found out later that winds had gusted to over 35 mph that evening. We discussed the possibility of ‘licking our wounds and heading back north at daylight, but the winds were against us; it would be a very sloppy ride north heading directly into the wind. Once we got passed the blame game, we realized that we were safe. We might not have been comfortable, but we had a great anchor to keep us put. We were fortunate in that we were close enough to shore to have two good landmarks for assessing whether we were dragging anchor; we had the flashing red light at the entrance to the channel, and a radio tower on land. Layla didn’t drift an inch all night. With the wind on her bow and three foot seas, I found myself levitating with the wave period. I finally fell asleep. I don’t think Bud slept a wink all night. We got up early the next morning, and decided to head south. 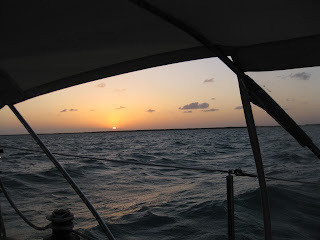 The winds were still strong at the start of the day, but slowly subsided as we changed course. We set up and reefed the jib early in the day, motor sailing the whole day. As the day progressed, the angry seas settled down, and we found ourselves surrounded by beautiful turquoise and deep blue waters. It was gorgeous. The beautiful turquoise and deep blue waters along Hawk Channel. Tracy actually at the helm for a change. 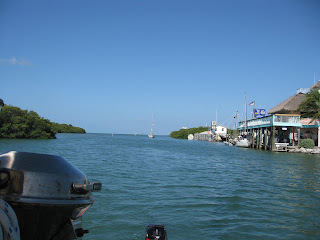 We made it to our next anchorage at Indian Key by around 4 pm. 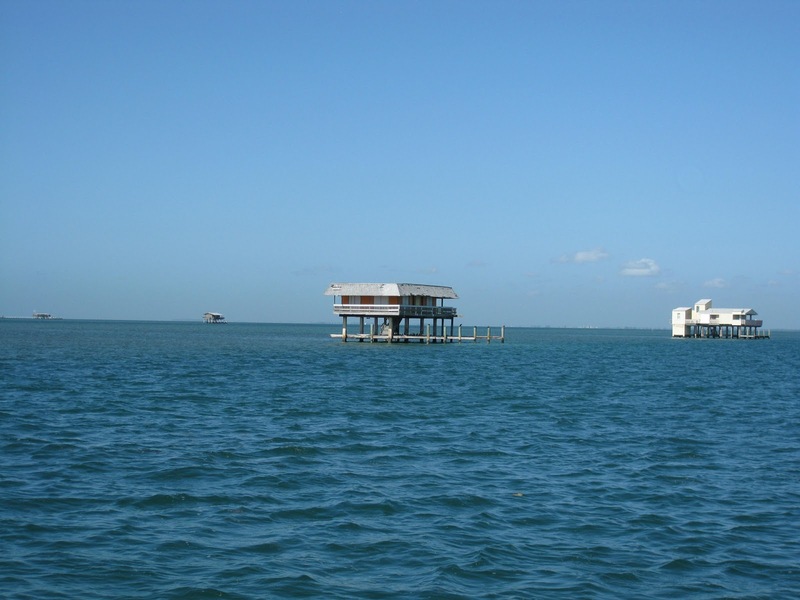 The anchorage at Indian Key was not ideal, as it was not well protected and embedded within crab pots, but the depths were just right around 11 feet. We turned Layla’s bow into the wind and started to drop anchor. 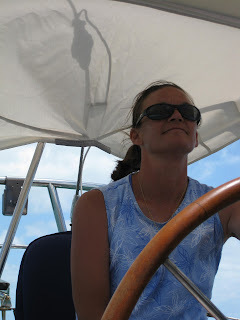 I was at the wheel and Bud was at the windlass when the wind started pushing Layla backwards and the chain jumped off the windlass capston and started paying out. Bud managed to lock the chain back into the capston and then I heard the most horrifying words, “Crap, I’ve lost my finger.” I ran forward and Bud had his hand wrapped in his t-shirt. 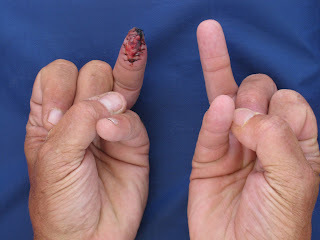 I was afraid to look, but we slowly opened up the t-shirt to see the tip of his ring finger torn off and the bone protruding. You can imagine the chaos as I went down below to find the various bandages and ointments in our first aid kit. Once the bleeding subsided, an ‘angel’ appeared. Bud hailed down the fishing boat and asked for a lift to the nearby road. Within minutes, the boat was on Layla’s side and Bud was whisked off to get help. Bud's ring finger after the stitches. We call it his 'lucky finger'. We couldn’t post this entry without our sincerest gratitude to all those who selflessly helped in our time of need. 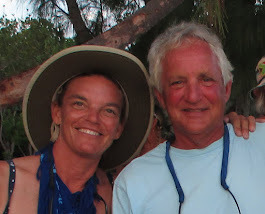 The two fishermen who whisked Bud off for help actually took him to the captains’ wife, who is a nurse, to assess whether Bud needed to go to the emergency room. 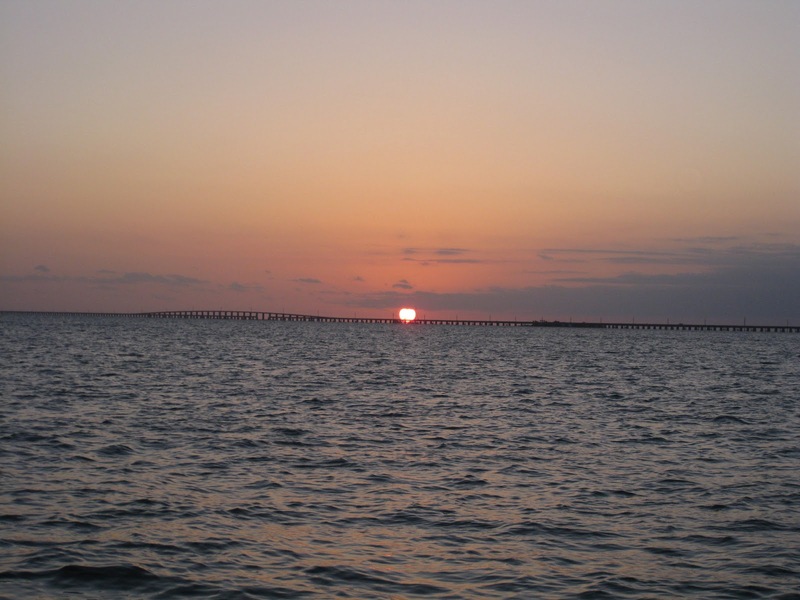 Bud recalls that he has never gone as fast on a boat as they did that afternoon; skimming the surface at ~50 mph on a motor catamaran. They were the ones who called the EMS to deliver Bud to the emergency room. And the nurse at the emergency room who took Bud to the boat ramp and find someone to bring Bud back to Layla. You can only imagine our worries as Bud makes it off to shore, not knowing how to get him back to the boat. I figured that I could manage to get the inflatable inflated and launched on my own, and I could imagine using the oars to row to shore and back again. But with the winds, rowing may not be an option. I could not imagine launching the outboard myself. So we were stuck, unless someone could bring Bud back to Layla. Again, we thank the nurse who went beyond her duties to find a way to get Bud back ‘home’. We woke up the next morning to kinder conditions. We picked up anchor and navigated through the crab pots. The winds were still off our stern, and we motor sailed the remainder of the trip with the jib reefed. 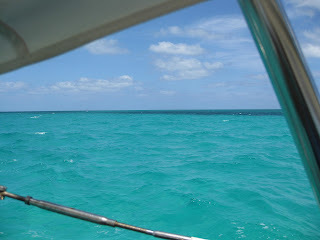 Today was just as beautiful as yesterday; turquoise blue patches amid the deep blue waters. A couple of dolphins joined us for a bit to catch our waves, and then headed off for more fun adventures. Dolphins joining us for a ride on the last leg of the journey. We made it to just outside our destination only to find that we needed to wait for a higher tide to enter the mooring field. 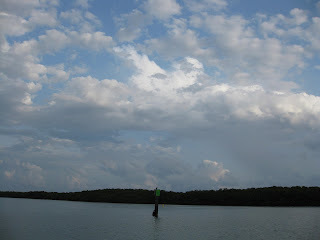 We dropped anchor on the outside, but still protected from the winds, and launched Zoe to check out the mooring field. It was a good thing to use Zoe as our scout, as there were several shoaling areas around which to navigate. 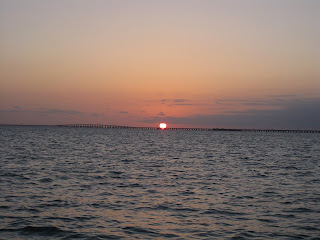 Sunset at anchor on the outside of the harbor overlooking the 7 mile bridge. The next morning at high tide, we successfully navigated the channel and found our mooring home at ‘U8’. Safe and sound at last. Navigating the final mile into the harbor. The view from Layla's new home on mooring ball U8 overlooking Boot Key.